2010. 2012. 2014. 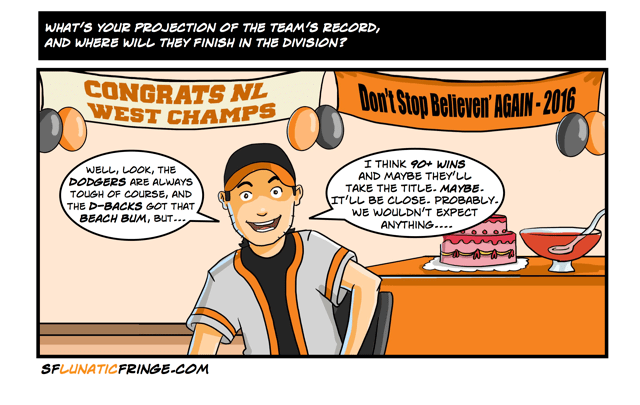 If you haven’t heard (and, being Cardinal fans and being victimized by this team in two of those campaigns, you probably have), the Giants have a nice even-year pattern going where they win the World Series if you can divide the year by two. Doesn’t matter how they get to the playoffs, that little extra magic seems to work in those years. 2016 is here, which means that somewhere, a designer is doing a rough sketch of a Giants World Series ring, just in case. To tell us if that even year bit has any chance of happening again this season, we’ve got three Giants bloggers to entertain you this afternoon. 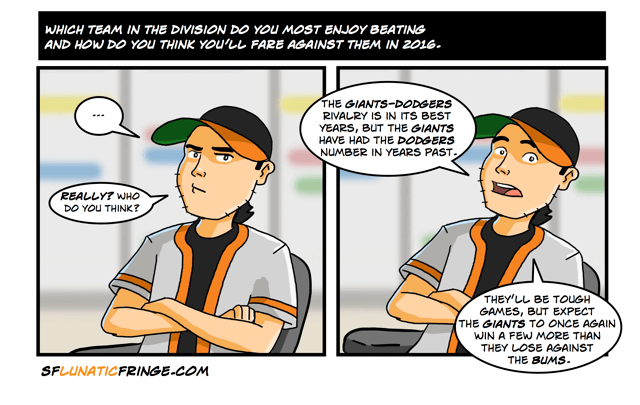 First up for the fourth straight year is our good friend Craig from THE San Francisco Giants Blog. As you know, I’ve always been warmly received when I’ve poked my head in over there during Giants/Cards matchups and it’s a lot of fun when I do. In fact, Craig put his answers up as a post and you can read the responses here. You’ll find Craig on Twitter @1flapdown77. Following Craig is Richard Dyer from The Giants Cove. Richard’s done this six straight years and puts his thoughts on Twitter @GiantsCove. Finally, we again are lucky to have Kevin Cunningham and his cartoon stylings from SF Lunatic Fringe. This is the fourth time (third consecutive) that Kevin’s been a part of this and you can follow him on Twitter @sflunaticfringe. SFGB: I would rank it as the best off season in recent memory. Adding two stud SP’s and legit lead off hitter was more than I thought we would do. Brian Sabean usually hibernates during the off season and wakes up around the trade deadline so this was a nice surprise. GC: To contend in 2016 the Giants had to address four serious needs. Since their minor league system is rated in the bottom third of MLB there was no one to bring up or to trade to fix these issues. So for the first time in 14 years the Giants actually spent money on multiple high end free agents. 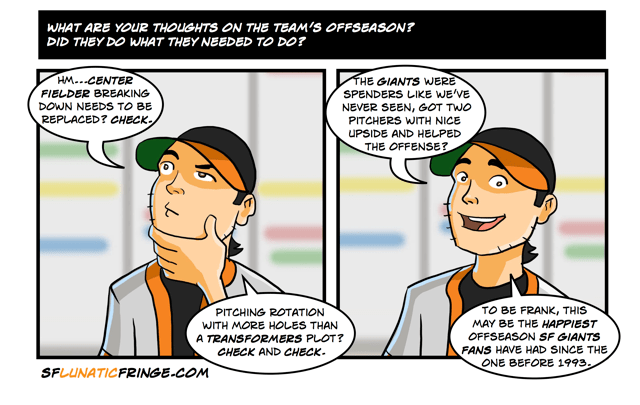 Need #1: Add another #1/#2 starter to complement Madison Bumgarner in the rotation. Result: Signed free agent Johnny Cueto to a 6 year $130 million deal. This was an outstanding move that immediately improved the team’s chances of contending. Need #2: Add another starter to fill out a competent 5 man rotation. Result: Signed free agent Jeff Samardzija to a 5 year $90 deal. I’m not big on the Samardzija signing—he’s one dimensional thrower with diminishing velocity. And Giants overpaid him by about $10-$15 million. Need #3: Fix the defense in center field and the offense in left field. Result: Signed free agent Denard Span to a 3 year $30 million deal. Span immediately takes over in center field, a huge defensive improvement, and adds speed to the top of the line-up. Unless the Giants make another deal, left field looks to be a potential black hole again in 2016. Need #4: Restock the bench with impact hitters. To save money, over the past five years management has gone with a bench of comprised of inexpensive over-the-hill players and under-performing younger ballplayers. None of them added WAR to the team’s defense or offense. Result: As of early March, no definitive improvement. This is actually a huge problem. C70: There’s been continuity in Giants management. 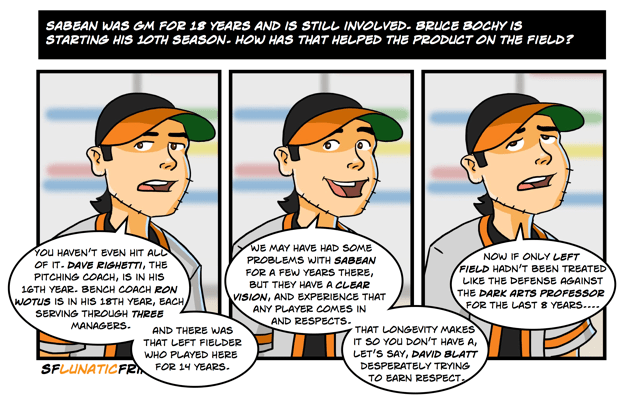 Brian Sabean was GM for 18 years and is still involved, Bruce Bochy is starting his 10th season. How has that helped the product on the field? SFGB: They work very well together. That seems a boring, obvious response, but if you are an Angels fan you yearn for something so simple. I’ve been told they eat together a lot. I’m going to go out on a limb and say that’s a good thing for longevity and success. GC: Continuity always has been the benchmark of this franchise, which can create a sense of stability. Formulas that work are replicated, whether or not they continue to work. Keep in mind that this franchise has had real success in only four of Sabean’s 18 years as GM. Still, not so bad: of the four World Series appearances he helped engineer (2002, 2010, 2012, 2014) the Giants won three. 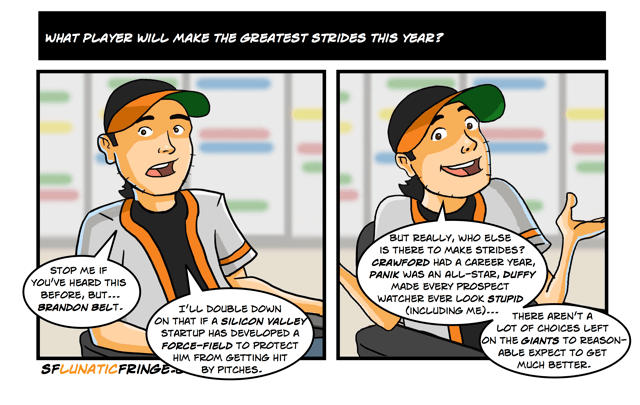 C70: What’s the deal with Matt Cain? Is there reasonable hope that he can return to his pre-2013 form? SFGB: Bad time to ask this question with him on the shelf again. But no one here trusts the Giants medicos and this is the 2nd cyst he’s had removed from that elbow since November. So, my feelings fall somewhere between *no hope* and *little hope*. 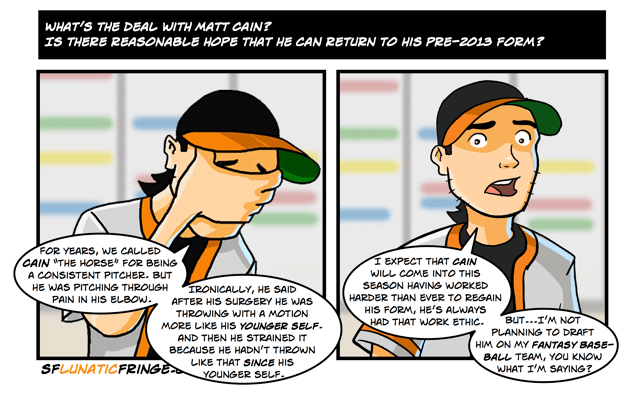 *Reasonable hope* is not part of my Matt Cain vocabulary. GC: No. Cain is now a bottom of the rotation starter, and he pretty soon he won’t pitch effectively enough to remain in the starting rotation. Cain has had several injuries over the past two seasons, but his decline has nothing to do with injuries. He has always been a one dimensional pitcher (see Jeff Samardzija above) and his pitching metrics have steadily declined. For example, Cain’s HR/9 has increased every season since 2011. Matt Cain is costing the Giants a lot: they paid him $60 million during his three year tumble (2013-15), in which he put up a 4.38 ERA. And San Francisco still owes Cain a whopping $47.5 million for 2016 through a 2018 buyout. The Giants can’t trade him because of his huge contract, and they refuse to release ineffective players to whom they’re paying huge contracts. SFGB: We have a nice mix of veteran and youth. I’m not looking for any one player to make great strides. I’m looking for everyone to play to expectations and if that happens we will win the World Series (again). There. I said it. GC: Second baseman Joe Panik. Panik is a pure hitter who will add power to his resume over the next several years. I think of him as a kind of the next Matt Carpenter, but with a higher upside. SFGB: I’m usually pretty pessimistic about seasonal records because it amounts to a *future bet* and I don’t make those anymore. Too many things happen. The original roster can look very little like the end of the season roster and who knows what will happen to the roster of pre-season contending teams? That said, I’ll go with 98 games. Yes I am feeling gooooooood this morning! GC: This team could win 85-90 games. But there is little depth anywhere in the organization, even with the off-season improvements made to the 25 man roster. I see them finishing 2nd in the 2016 NL West to the Dodgers. 2016 will demonstrate that the Los Angeles Dodgers haven’t lost a step after winning three NL West Division titles in a row. And the Arizona Diamondbacks have now become legitimate contenders. SFGB: Of course it’s the Art Dealers but not like I enjoyed it in the old days. Times change. I like beating the Rockies a lot because I hate all Denver teams. I’m not sure about the number of wins we have vs them. I just want to beat the stuffing out of them every time we play. GC: I enjoy beating whichever NL West team has the most wins at any given time during the season. Playing the Rockies at home in Colorado is a nightmare, so any Giants win in Denver is always a big bonus. I appreciate Craig, Richard, and Kevin bringing us the insights on the NL team by the bay. Let’s hope for a rematch of 2012 and 2014…with a better result!